Silay Institute faculty and staff went early morning of March 27, 2013 to Brgy. Balaring, Silay City for mangrove planting as part of the school’s community extension program. The said activity aims to enhance awareness of the value of mangroves, to revitalize mangrove forest in reaching balanced ecosystem, and to help protect and strengthen the coastlines. Each employee planted ten (10) seedlings of “pagatpat” and “bakhaw”, which were the most common variates of mangrove trees. 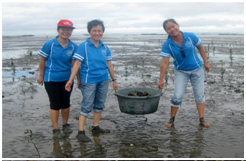 Everyone enjoyed the activity as well as the muddy and mushy shores of Brgy. Balaring.